Alec Lightwood: I know how important magic is to you, but is it really worth dying for? Magnus, answer me. 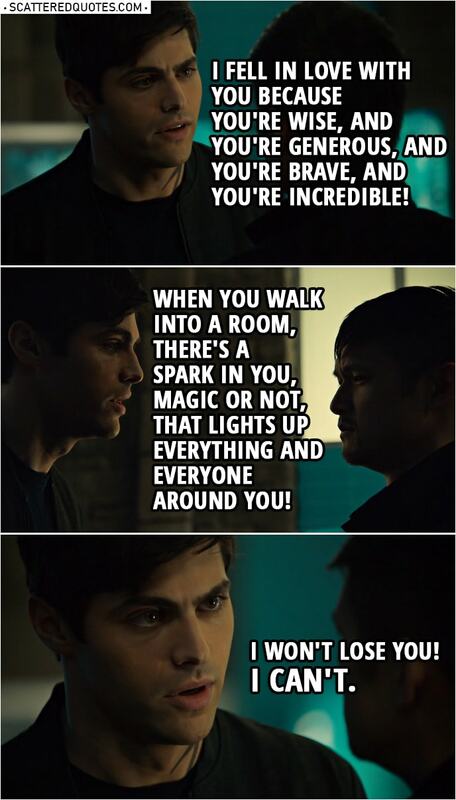 Alec Lightwood: How can you even say that? Magnus Bane: I am nothing without my magic. You fell in love with Magnus Bane, High Warlock of Brooklyn. Can you honestly say that you don’t feel differently about me? Look at me! Can you honestly say you like this?! Alec Lightwood: Yes! Your powers were incredible. But that’s not why I fell in love with you. I fell in love with you because you’re wise, and you’re generous, and you’re brave, and you’re incredible! I just… When you walk into a room, there’s a spark in you, magic or not, that lights up everything and everyone around you! And… and… hey! I won’t lose you! I can’t.